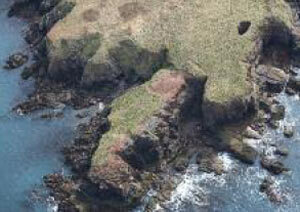 Archaeological excavations have revealed that Mesolithic peoples occupied the promontory of The Nab Head on the southwest Pembrokeshire coast approximately 10,500 years ago. At this date the site would have been approximately 6km from the coastal edge making it an inland site with good views over the coastal plain. No settlement evidence was revealed but many thousands of stone tools were discovered here, including microliths, drill bits, scraping tools for cleaning skins and the waste flint from their manufacture. Of interest are over seven hundred perforated shale beads found among the discarded tools and debris of the community working on The Nab Head. Although such beads are found on other similar dated sites in Britain, the large number of beads sets the site apart. 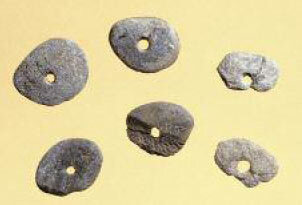 Conceivably the beads were tokens of status or even traded between Mesolithic groups. 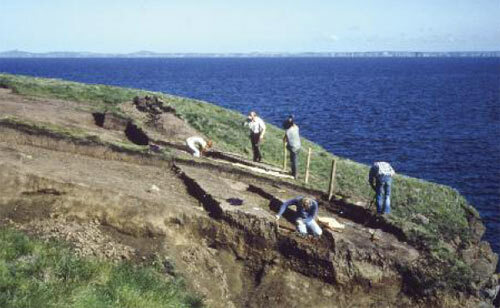 Flint and stone continued to be worked on the headland well into the later Mesolithic.